The Flashtech CMD OBD tool is the perfect match for tuning VAG vehicles over the other common tuning tools such as the Alientech Kess V2. Standard procedure for tuning later VAG ECUs such as EDC17 / MED17 has always been on the bench with an appropriate boot loader tool. While boot loading is a good method, as the full ECU can be backed up in case of a problem, this method involves risk and takes up time. Boot loading would also be more suited to a workshop based outfit and not something that the lesser experienced mobile tuner would take on. Most OBD flash tools on the market can offer the flashing of these later ECUs but none can offer the same functionality of the CMD. 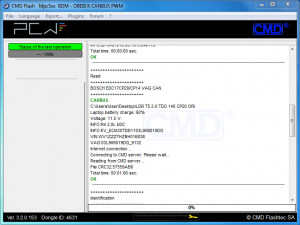 CMD can identify all VAG controllers including DSG (on CAN) and READ 99% of the ECUs via the OBD port or download a VIRTUAL read from CMDs server in less than 30 seconds without any ECU intervention (Bench unlock). KESS can identify these controllers but is unable to provide the user with a file. The user must either request an original file from Alientech or ask their tune provider for an original file to work with. If no original file available, the user must remove the ECU from the vehicle and carry out necessary bench work. This method takes time, involves risk to the vehicle removing anti-tamper bolts and also risk of ECU damage if care is not taken. 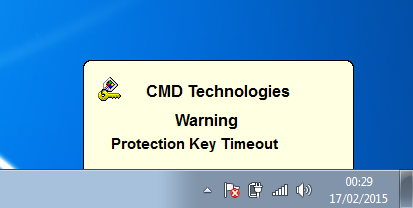 The CMD also has a few other features the Kess does not have. 100% BACK TO STOCK is now on both master and slave CMDs. This button is available on the new VAG UDS protocols; it restores the ECU Back to 100% stock. The UDS protocols are VAG vehicles 2008+ starting with the B8 chassis. These are for ECUs that are unable to be read out via the OBD port but can be flashed OBD. This function can literally save hours of time messing around with a previously tuned ECU that requires a rework. CLEAN ORIGINAL FOR TUNER TO WORK WITH. 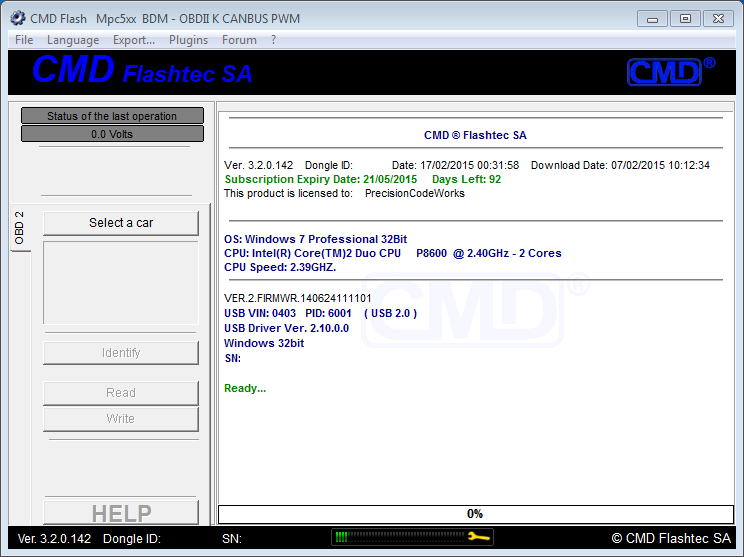 CMD MASTER users also benefit from being able to flash VAS software updates via OBD direct from VAS DVD. 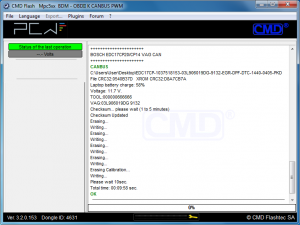 The CMD is able to read / virtual read / flash 99% of VAG group ECUs. So, with the exception of 4 ECUs, 2 Simos, of which are old cars, Audi RS3 aren’t that common and that leaves PCR2.1 to unlock. 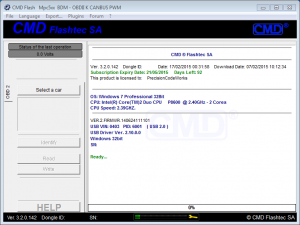 Let’s take a look at the CMD OBD flash tool. The tool at first glance is what would be classed as an all in one tool. Apart from being solely an OBD flash tool it can also be upgraded to support a number of boot loader protocols. 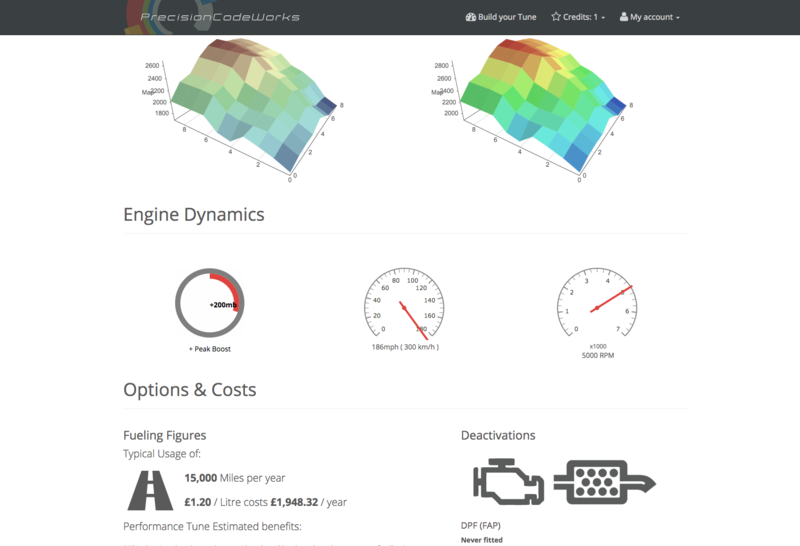 On this occasion we will be just looking at the OBD part. So, to make it simple lets break it down in to different parts, let’s first look at the GUI and software. The first thing you will notice with CMD is that the tool is secure, in the fact that the software and the tool have a security protocol. The tool must go online and handshake the CMD server at set points in time. This ensures total tool security against cloning and also from theft. After pairing the tool to the PC we can now start the software and have a look at the layout and protocols offered. 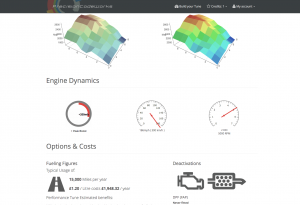 From the first glance the software looks very basic in terms of a fancy GUI, as unlike its competitor all the vehicles are not laid out with make, model, engine size, output etc. 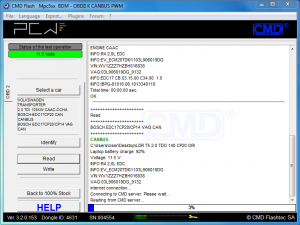 The CMD is a tool for people who are already at an advanced stage of chip tuning, where they don’t need a babysitter and should already know the differences between vehicle models and ECU specs. The CMD has another major feature under its belt, a VIRTUAL READ function. 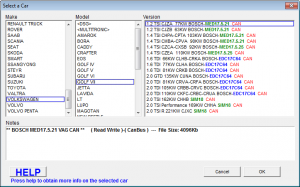 This feature lets you download original files from CMD’s online server 24hrs a day for ECU’s that cannot be ready by OBD alone. This includes boot loader only reads such as ME7, ME9, MEDC17, Simos, Visteon DCU102 and the once popular EDC16 Opel ECU. This was a major breakthrough for Opel vehicles, where tuning, EGR and DPF modification could only be done by BDM method. The CMD can virtual read the full BDM file then write the full modified file back through the OBD port, thus saving time and removal of the ECU. Read speeds with the CMD are undoubtedly the fastest out of any of the tools. Virtual reads are circa 30 seconds; with OBD reads with vehicles on CAN usually range from 2 minutes to 20 minutes. This is a major positive for busy shops or mobile users. Flashtec are also at the forefront of new protocols and read/write techniques. They release a steady stream of very usable updates, usually first out of the tool manufacturers, which work first time. The tool has industry standard features such as a battery real time monitor, a recovery function in case of interrupted flashing, DTC clearing function, automatic checksum correction for all protocols, Automatic resistor switch-KLine 470 ohm pull-up resistor for VAG EDC16. Overall the CMD is a very stable tool, Very reliable and gives you piece of mind when you press read or write button that the tool will perform. 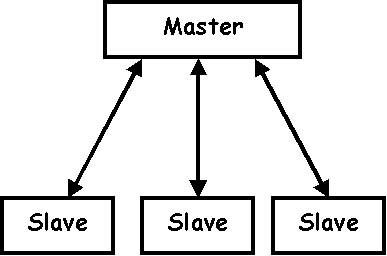 As with everything, one tool cannot be good at everything. The only downsides that can possibly be found to the tool are that of the older / unpopular protocols i.e. older ford/jaguar vehicles and some Japanese petrol vehicles, but on the flip side it can flash all the newer models. Also with the CMD the online protocol / virtual read functions can be problematic / slow / not work if you are not in a wifi or 3g/4g data area. Unlike its competitor, the CMD does not come with the free ST boot-loader function but in comparison it is not really required as the virtual read will give you the required file. The boot-loader is only required to read out already modified files. I would score the CMD a 9/10. Positives would be unrivalled read and write speeds, the virtual read function, its security and also the upgradability of the tool – so a 2nd tool does not have to be purchased. Negatives would be that a few of the older vehicle protocols are not covered and the tool can sometimes be a problem without an internet connection.